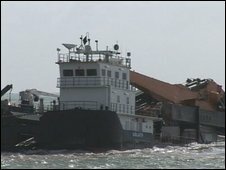 A crane barge which was at risk of sinking in the English Channel has grounded on a Kent beach. The unmanned 220ft-long (67m) barge, the Goliath, was being towed by a tug with five crew when it began taking on water as it approached Dover port. The planned entrance was abandoned and the tug, the Sea Alpha, manoeuvred the barge towards the beach near Walmer and secured it with lines. The Maritime and Coastguard Agency said the crew on board the tug were unhurt. Its counter-pollution team was alerted, as were Kent Police, the Dover all-weather lifeboat and the coastguard emergency towing vessel, the Anglian Monarch, when the emergency began just before 0500 BST. The barge was carrying 130,000 litres of fuel oil, along with other lubricants and hydraulic oils, which is used to power the generators needed on board the vessel to work the machinery. The Environment Agency said initial investigations showed the tanks were intact and no notable spills or leaks had been found. It said the vessel would be repaired and refloated later on Friday. 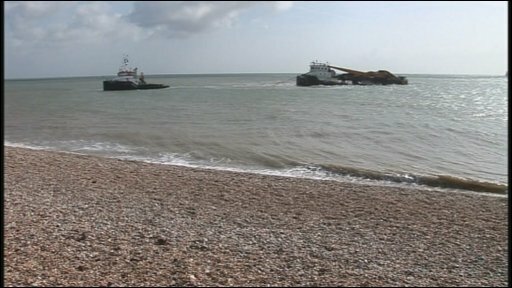 The MCA confirmed that the barge, which beached between Deal and Kingsdown, presented no threat of pollution. A spokesman added: "The Dover all-weather lifeboat has now returned to base. Multraship of Holland are now on scene, as the appointed salvors.